Who knew that Arnold Lobel, author of the beloved children’s book series, Frog and Toad, also created illustrated books. 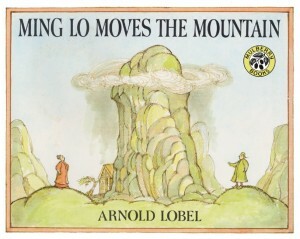 Ming Lo Moves the Mountain is a lovely children’s book that makes a subtle and useful point, without ever seeming pedantic or lecturing. This little children’s book is a perfect read-aloud for ages 5 to 7. And with it’s lovely Chinese-style images, the book might also be enjoyed by some independent readers in the second grade. The artwork alone makes this children’s book worth having, especially if you have a love of Asian art, as I do! It is not clear if this is a traditional Chinese folktale, but it certainly reads like one. My guess, however, is that Lobel invented it, which makes this simple children’s book all the more impressive. Many of my friends had read it to their children, and are now purchasing it to read to their grandchildren. It’s a must for a school library or early grade class library. Can Ming Lo move the mountain, as his wife wants him to do? Hmm… well, you’ll have to read all the way to the end to find out.